Knowing that every borrower is unique and that every situation is specific, Approved Funding entertains many non conventional mortgage program options that can cater to almost any “qualified” applicant. 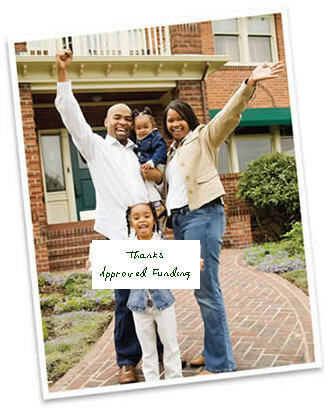 If there is a way to get you a mortgage, Approved Funding can make it happen. As a Licensed Mortgage Banker, Approved Funding derives its mortgage products from many sources and avenues unlike banks or savings institutions, which are often limited by the availability of their own deposits and a conservative lending philosophy. We also maintain relationships with organizations such as the Federal National Mortgage Association (Fannie Mae), the Federal Home Loan Mortgage Corp. (Freddie Mac), and many other institutional investors to insure that the most competitive and diverse lending products are available to our clients. We are delegated underwriters for Fannie Mae, Freddie Mac, Ginnie Mae and many jumbo products. With hundreds of programs to offer our customers we work hard to ensure that the final mortgage program matches the unique characteristics of each of our mortgage applicants. 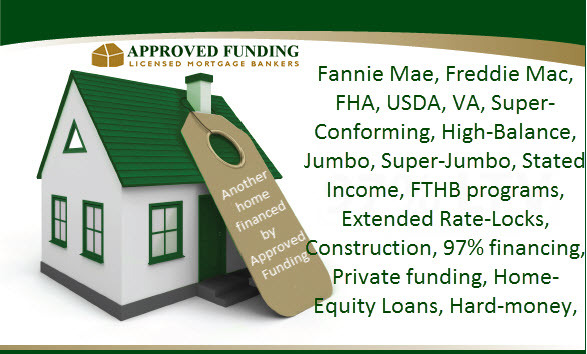 Approved Funding continually works with our national and local financiers to develop mortgage loan programs that fill the changing needs of our customers and the real estate market. Get a Free No Obligation Rate Quote from Approved Funding now! You will not only receive a low mortgage rate quote customized to your unique situation but you will also receive guidance as to the best time to lock your rate and insight into market activities that will effect mortgage rates in the coming days and weeks.